Siltbuster's innovative PMPU20 CO2 pH adjustment and fine solids separation unit reduces the pH of process water, groundwater or run-off on site, for discharge to a sewer or watercourse. High pH content in groundwater. High pH content in leachate from slag and PFA lagoons/stockpiles. 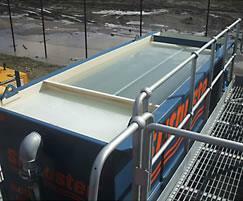 High pH content in water from concrete and mortar batching, site concreting operations and hydro-demolition. Using carbon dioxide (CO2) vapour, the units provide a staged approach to pH reduction from in excess of pH 12 down to neutral (pH 7). 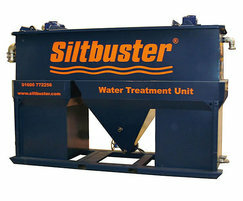 By carrying out the pH reduction in stages, the system allows any precipitated solids to be removed in an integrated Siltbuster settlement unit, before the water is discharged or reused, thus ensuring the quality of the water. Siltbuster can also provide pH adjustment and dosing equipment to adjust the pH of acidic waters by adding alkaline reagents or acid, to reduce the pH of alkaline wastewaters.